I recently made a trip to Madrid to interview several of Real's players and club president Florentino Perez. All of them talked about how expectations were raised this season because of the investment made over the summer. Perez especially stressed the importance of the club becoming a contender for the Champions League title, a competition they haven't won since 2000. Manuel Pellegrini is under pressure to remedy Real Madrid's recent shortcomings. Well, they didn't look like contenders on Wednesday night, did they? Real lost to a Milan team which had won just three of nine games this season and whose first XI would have been great five years ago but now, honestly, looks like largely like a group of has-beens. The average age of the side Leonardo sent out at the Bernabeu was 30.8. Now the excuses have already started rolling out of the Bernabeu. 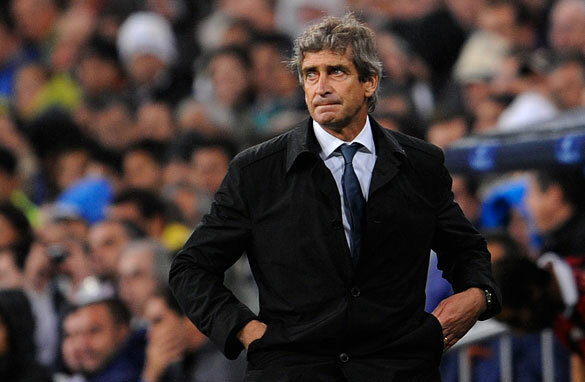 After the defeat to Milan, coach Manuel Pellegrini said he needed time to build his team. He added that he thought the game wasn't that bad. Well, the press thought otherwise and in response to that comment, Marca asked, on its front page, "What game were you watching?" It may be too early for alarm bells, but Pellegrini won't get much time to get it right. I can guarantee that. In his last stint as Real president, Florentino had six managers in six years. He expects the best, always, and has no problems pulling the trigger when it comes to firing coaches. So what is going wrong? For starters, the defense isn't good enough. Pepe is and has always been overrated, so much so that with Portugal he doesn't even play at center-back sometimes - Carlos Queiroz uses him in midfield. His heading is poor and his concentration erratic. Neither Marcelo nor Drenthe are great left-backs. They are both great at going forward, but don't have the necessary discipline to track back everytime the team loses possession. Sergio Ramos is OK but I still think he is better as a center-back than a right-back. Raul Albiol is solid, but not the leader the Real backline needs. In other words, I expect Real to concede bags of goals this season. They will score them too, but Pellegrini might need to think about playing with two defensive midfielders to protect a shaky defence. This means Kaka could be forced into a wide position. Curiously, Madrid had a similar problem during the first instalment of the Galacticos. Zinedine Zidane had to be dragged out to the left so the manager could fit all his stars in the team, while at the same time ensuring some solidity in the center of the park. Kaka dosnt seems concentrated enough... Raul still thinks he is the greatest ever, Guti always on the bench, and the preassure on Casillas is always too hot. They should buy Juan Vargas from Fiorentina and a central defender from an English club. I couldn't agree more with you. This is Mr. Perez dream team, the one he wants to enjoy from his seat, every weekend. Pellegrini is just trying to sort out the mess. Another coach won't change anything. First of all RM fans, players,managers need to change their mentality. Take it slowly. Have patience. Believe in the team, the coach. That's not gonna happen. Simply the Real fans are still recovering from last season defeat. Against Barca's Treble season, against something FCB achieved out of hard work. That was a year to forget. Perez arrived as the Messiah, who could answer all their prayers. And after Ramon Calderon shameful campaign, everybody gave the approval to Perez to do as he pleased. It's not time to pick up the harvest of what these group of players and coach team, will produce. Being a Barca fan, I think that Real Madrid will be a tough threat. But not yet. Power without control is useless, and Pellegrini needs the right time to find this authority! they last won CL in 2002. I think you're being a bit harsh on Real Madrid based on their performance on Wedenesday. Yes, there were some defensive frailties, but they were simply beaten by a better, hungrier team on the night. Leonardo's Milan may be old, but they countered that by playing with their hearts, and, who knows, maybe to save the manager's job. Ronaldinho, who'd previously lost the ability to ghost past players as if they weren't there, had perhaps his best game of the season. Clarence Seedorf was involved in everything. And, apart from his glaring mistake, Dida was excellent, pulling off a couple of world class saves. Madrid, by comparison, had an off day, just as Barcelona did against Rubin Kazan the day before. But the Galacticos are still in good health, lying second in La Liga and still level on points with Milan on top of their Champions League table, from which the top 2 will advance to the knock-out phase. So calling for the head of Pellegrini sounds a bit stupid because it's way too premature. agree wit u perfectly pedro...d back line a disaster ,defensive midfield cover inadequate.....and time is running out for pellegrini.but which central back can madrid lure in january dat d big question?? and the departure of d dutch duo(robben and wesley) is becoming obivious!!! Real need gud a good backline.plain and simple.whether it means splashing some more cash come january or getting from its youth system-which isnt so hot-wateva. just get good defenders.even man city boasts a better backline in toure,lescott & co! I definitely agree with you Pedro. But I think this time around Perez should try to have faith with the manager. I think Real is very strong this year especially with Kaka, Ronaldo, and Benzema. With the porous defense Real currently have, Pelligrini sure needs to strengthen the defensive line and I think he deserves the opportunity to do so. The real madrid coach has to fix his defence,its inconsistent,otherwise he is skating on ice for sure!!!!!! For a club to be successful,a long term plan is more important than the best players in the world.Chelsea did buck that trend,but in Mourinho,they had a manager who was so good at deflecting attention to himself,all the players had to do was go out and play.A good coach will still need plenty of time to get the best out of his players.Its one thing to be a gifted player,its another to harness your ability to the team's collective well being wagon.Looking at Real and Barca,the former go through so many coaches.What has it produced?A thoroughly dysfunctional set up that only breeds paranoia.Look at how long Sir Alex has stuck by some of his players,many of whom have been out for years in sick bay.But he's then rewarded with astounding performances by men who had been written off by everyone else.That is what Real need.Pick a coach,stick with him even if it means putting a gagging order on their president,whoever the madman happens to be at any given time. of football. He's been a flop at it and R. Madrid will go nowhere with him. It's not the players or Pellegrini. It's the chronic disease that has plagued R. Madrid for years: Incompetent and at times corrupt ownership.